I took a ghost tour on my first evening in Savannah and it was a great way to hear the tales and to also see the beauty of the historical buildings in the city. But, I really needed to see them in daylight, so on my second day in the city, I headed out to run. 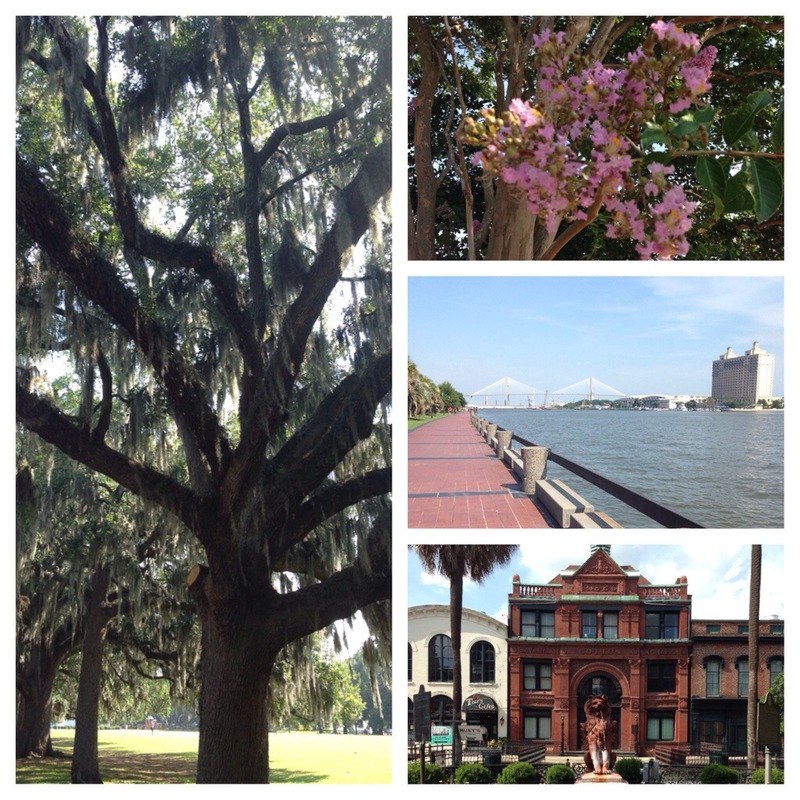 Savannah is a traveling runner’s dream. Turns out that Mr. Oglethorpe designed a city that would be easy to navigate for out-of-towners. The original city was designed with 24 squares and 22 remain today, some with parks and fountains gracing their centers. So, as a runner, you essentially navigate a grid and can easily get back to your hotel with little worry about a GPS giving you turn-by-turn directions. 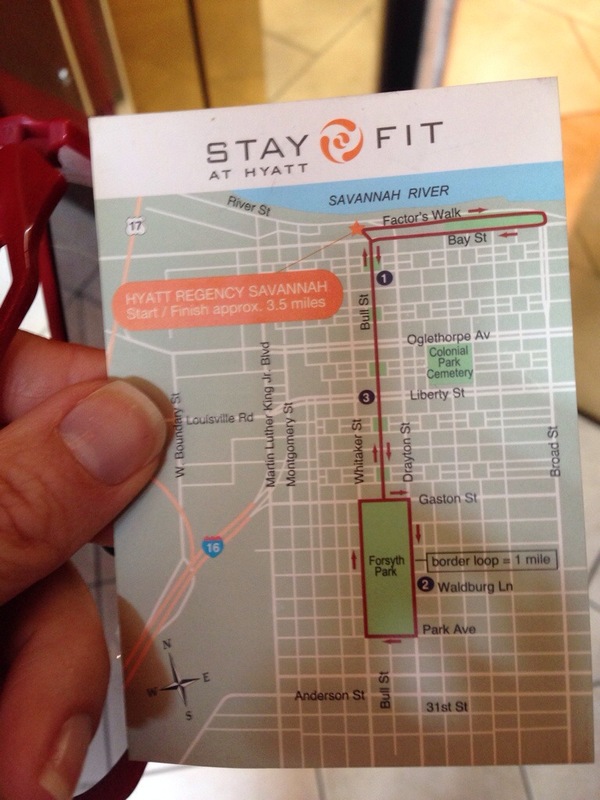 I checked in with the concierge at my hotel and he provided me with this great map that suggested a running route. If you’re staying at a large hotel, be sure to ask if they have a small map available, just in case you’re paranoid of getting lost (as happened to me on a previous vacation!). 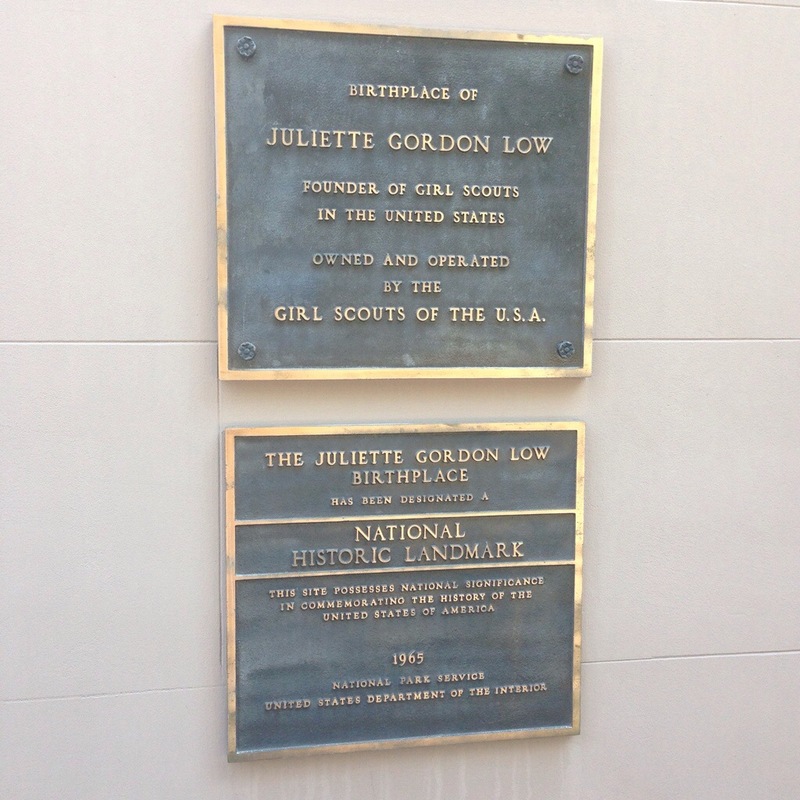 As I neared mile 1.5 of my run, I noticed a large group of Girl Scouts and realized I must be near the home of Juliette Gordon Low, founder of the group. I stopped by and peaked in and enjoyed seeing all the young women excited to be seeing her birthplace. 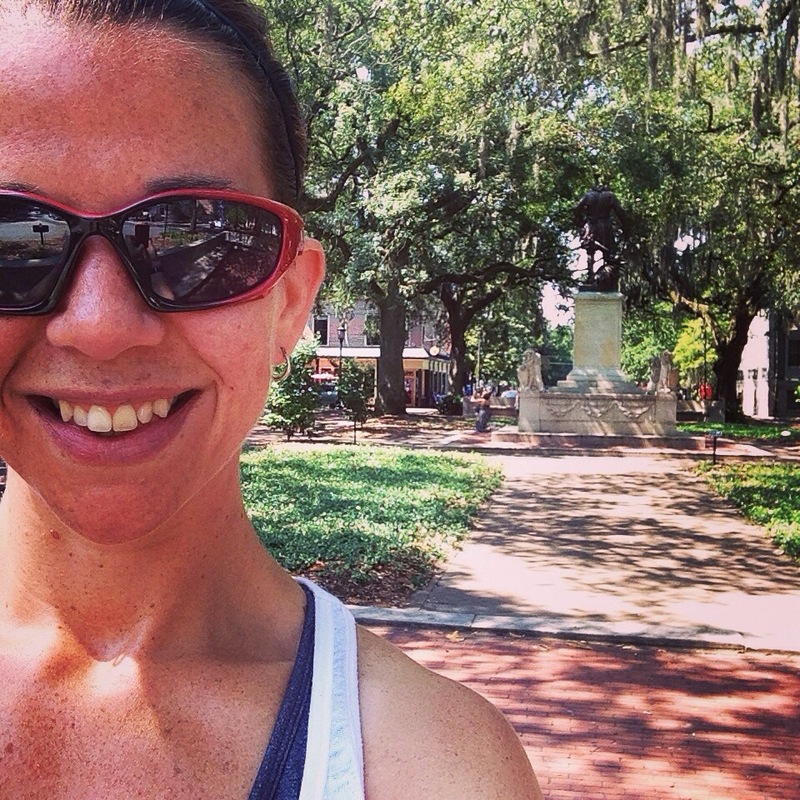 I headed next to Forsyth Park and looped around once to add another mile to my trip. Runners were everywhere on this path and I can see why – the shade of the trees that line the park give you some great relief from the heat and the park itself was hosting two different exercise classes and a farmer’s market as I was running by. One loop around the park = 1 mile, making this a great way to extend my run without having to navigate at all. My final stop, after circling back to find it, was to see the famous bench where Forrest Gump awaited a bus to see his Jenny. I found the square – Chippewa – and realized there was no bench. I later learned that the bench had been removed and placed in a museum, but stopped anyway in order to see where the scene had been filmed. If you’re not a fan of the heat, plan on running early to avoid the climbing temperatures. If you do head out mid-day, make sure you have some sunscreen and water. Day time temps were in the 90s during my June visit, with high humidity. Many streets and sidewalks are brick – mind your steps. I’m not exactly graceful and I had to be careful in some spots to watch for uneven surfaces. Summer traffic includes cars, trolley tours, horse-drawn carriages and rickshaw-style bicycles. There are many one-way streets, so stay mindful of traffic and right of way. If you’d like to make your run a point-to-point, rather than a circle or out & back, you can plan to pick up the DOT somewhere along the way, a free transportation system for tourists & Savannah residents. Want to run the Tallmadge Bridge and see Savannah too? I found the Savannah River Bridge Run while doing some research and it looks like a great chance to race and see this great city.